In July 2014, I was asked if I would like to assist with coaching one of the group training sessions for Hall Cycle Training Women’s Group. I took responsibility for coaching the intermediate women’s group session once a week. I have been running group training sessions for developing and intermediate riders on a weekly basis since July 2014. I have also delivered cycling skills training to groups of school children. I enjoy analysing cycling skills and the techniques of riders to help riders to improve their technique and become more proficient cyclists. The types of skills I teach include bike handling, cornering, riding in traffic, climbing and descending, sprinting and braking, and self-awareness as a cyclist. I also incorporate intervals into group training sessions to develop specific fitness components. In addition to group training sessions, I have been developing and delivering training programs since early 2015. I currently work with a small number of athletes, developing training programs that fit with their other commitments and help them achieve their goals. responding to questions and feedback from the athletes that I train, and following up with further information as required. I ride because it makes me happy. It is also a great excuse for travel, an ideal way to explore the world, and a social yet individual sport. I love challenging myself and feeling fit and strong. I ride because it keeps me balanced. I ride because if I don’t ride I feel stressed and less happy with my life. I ride because I need to. I have been a “cyclist” since 2011, when I started commuting to lose weight and get fit. In late 2011, I borrowed a road bike and completed some community cycling events and two short-distance triathlons. In 2012, I joined a cycling club and started doing more group rides. I also bought my first road bike. 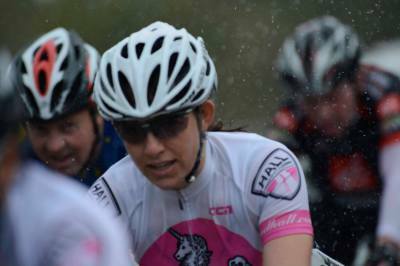 I joined Hall Women’s Cycle Training in January 2013, which was the start of a big year. In April I did the Five Dams event plus qualified for the UCI World Cycling Tour (UWCT) time trial, which was held in Italy in September. I competed in my first time trial and road race in 2013, which lead to racing almost every weekend. In September, I travelled to Europe and competed in the final qualifying event for the UWCT road race – this involved a 140km road race with five mountain climbs in the Pyrenees in pouring rain. This still stands as the hardest event that I have completed. I then completed the UWCT final time trial and road race in Trento. The time trial was extremely challenging, with a very fast technical descent through a town and a mountain climb packed into 20km. The road race was also challenging and as I watched the rest of the peloton ride away up the first climb I quickly realised that it would be a day to “enjoy the experience” of riding in Australian team kit, on closed roads, in Italian sunshine, with crowds cheering “allez Australia!”. 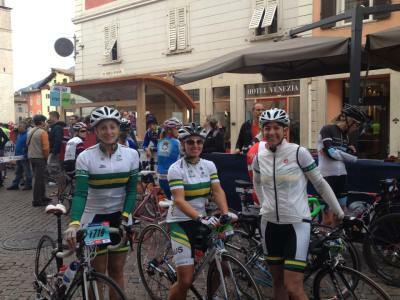 In 2014, I started the year with a big event – the Three Peaks Challenge in the Victorian Alps. This was another very challenging event, which took 13 hours to complete, but it was an enjoyable experience thanks to terrific weather and thorough preparation. After purchasing my first mountain bike, I decided that 2015 would be the “Year of the Mountain Bike”. 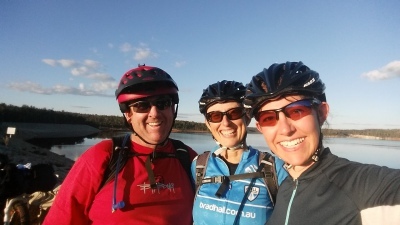 I have ridden half of the Munda Biddi trail, riding in sections from Mundaring (Perth) to Nannup. This has involved several day trips and two multi-day trips, carrying 20kg of luggage and camping out over several nights. 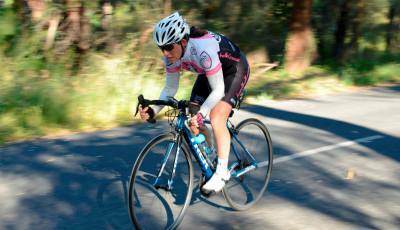 I am also looking forward to riding the four-day Cape to Cape mountain bike event in Margaret River. 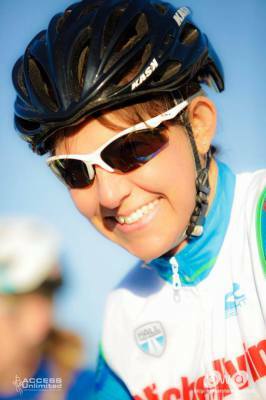 As well as mountain biking, my main goal for 2015 is to ride Amy’s Gran Fondo and qualify for the UWCT Finals in Perth in 2016. I am continuing to explore my abilities as a cyclist and to do “epic events” and racing, while trying to maintain some balance in my time commitments. I enjoy developing my skills and knowledge and am passionate about helping others to challenge themselves and develop their potential.